"A painting should be tough; it should have muscle, but I have to find some tenderness in it, too. There has to be that dynamic." 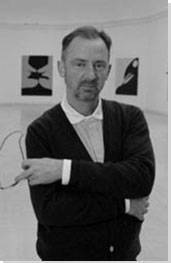 Gary Hume is a British artist whose membership of the notorious Young British Artists (YBA) movement in the 1990s first brought his paintings to public attention. But unlike several of his YBA contemporaries, Hume avoided much of the extreme partying and tabloid notoriety that characterized the movement throughout the decade by preferring to focus on the development of his abstract, minimal, and often wryly narrative visual artworks. Using broad planes of color and household gloss paint to suggest familiar objects (such as hospital doors), his artwork came to be championed by international art dealers like Charles Saatchi as an innovative contemporary minimalism. Hume later moved away from this established and commercially successful abstract formula in order to explore new modes of representation, foregrounding more recognizable objects and imagery within his paintings and branching out into sculpture and photography. No matter what the medium though, Hume's work uses abstraction to ask subtle questions about the world around his viewers, the cultures invisible to those embedded within them, and the nature of visual representation. Hume's work is inherently postmodern in its influence by, and combination of aspects of, several different art-historical precedents. It combines ideas of audience engagement and relation with the art object drawn from early 20th century Minimalism, images of recognisable and familiar objects that reflect Pop Art, and formal aesthetic experimentation and visual subversion with roots in the Op-Art and Neo-Geo artistic movements. The choice of materials in Hume's work is both technical and conceptual. Through industrial and household gloss paint, the materials most often associated with his practice, he is able to reproduce a high depth of color field and shine, allowing the viewer to see themselves literally reflected within his abstract paintings. But these paints also suggest industrial activity and institutional conformity, as well as accessibility and familiarity. They therefore embody conceptually ideas that Hume represents abstractly, such as the ubiquity of institutional design (as in his images of hospital doors). Hume produces art in easily discernible series of work, creating a number of pieces that adhere to a particular set of rules or formal principles before abandoning those in favour of his next project series. This process of focused experimentation and development has remained characteristic of his activity since his time as a student at Goldsmiths University in the 1990s. Related to this process is Hume's remarkably driven and un-self-conscious character, producing artworks with little regard for fashion or commercial success. This is most apparent in his early commitment to abstract painting, but also to his later move away from it. Hume has throughout his career shifted gears, embarking on new projects outside of the strict limits he had previously placed on himself and often against the advice of gallerists or peers. 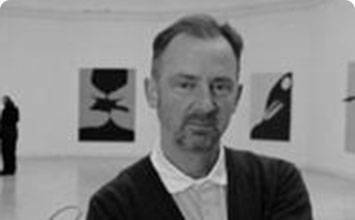 Gary Hume was born in 1962 in Tenterden, a leafy middle-class town near Ashford in the English county of Kent. He says that he often felt attuned to the natural rhythms of the countryside around him, recalling, "I love to see a wood full of bluebells. Growing up in the Kent countryside, I have special memories of this brief annual spectacle." He was the second youngest in a family of five siblings, raised by his mother alone, after his father left when Hume was 18 months old. His mother worked as a National Health Service (NHS) surgery manager but also had a love for art and poetry. As Hume recalls, "My mum always liked poetry, and she had pictures on the wall, so there was this visual stuff around." Interactive chart with Gary Hume's main influences, and the people and ideas that the artist influenced in turn.